We drove about 10 minutes from Brixen to Kirchberg, the northwestern end of Kitzbuhel’s interconnected lift system. Near the top of the Kirchberg gondola was a snowmaking pond. The ripples on the surface are from nozzles beneath to keep water circulating. View north from top of Kirchberg gondola. Top of Hahnenkamm is at right. Prominent peak is KItzbuheler Horn, which is a separate ski area on same ticket but not lift connected to the rest of the complex. The public was not allowed on steep icy sections like this. The next drop was open but few people skied it as snow was still hard. Lower down a broader view of the upper course. Farther down, a view of town and the Horn on the other side. The helicopter was very active taking down some of the temporary race infrastructure. It was another clear day. Snow as at SkiWelt has a widespread snowmaking subsurface, perhaps a few more firm spots. But overall Kitzbuhel has much more of an alpine ambience. Lifts typically top out 6,000 to 6,500 feet, which means the upper 1,000 vertical is above tree line. The top of Steinbergkogel is steep and due north facing so I ventured off the piste to check it out. Lots of Gasex up here as the piste is directly below. I stuck to the skier packed line of stiff packed powder. We then cruised some pistes on the Pengelstein D3, D5 and D6 lifts. Overview of this area from the opposite side of the Aschau valley, pic taken the next day. There’s a lot of room there for fresh tracks on a powder day, but of course the snow is way too old and set up to venture off piste at low elevation now. 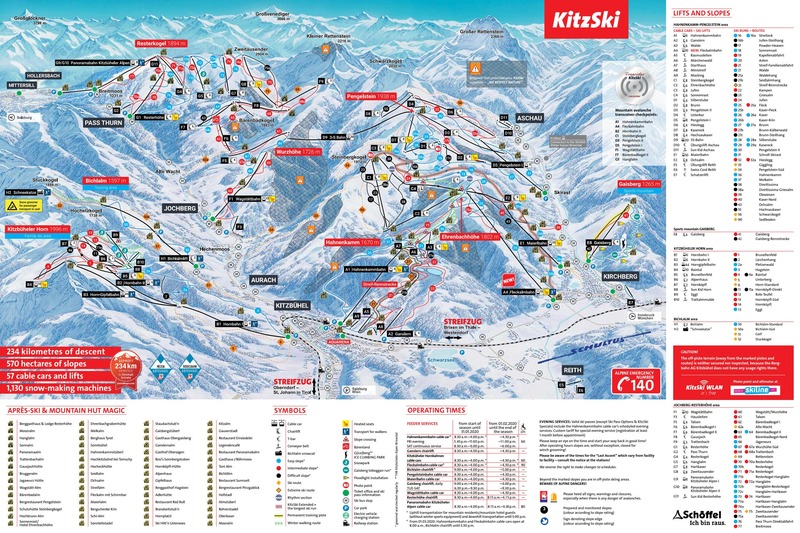 Speaking of off-piste, James sent me an article about an off-piste guide in Kitzbuhel. The prime area for guided skiing is marked 3S on the trail map. It is an expansive area with 2,000+ vertical fall lines under the gondola that was built to connect Kitzbuhel with Pass Thurn in 2007. We could see a plowed cat track that would make exiting that canyon not too difficult. Zweitausender at the far end of Pass Thurn was direct north facing with a decent fall line of chalky moguls. Pistes over here were generally better with the north exposure and less traffic. There was also a champagne bar with a nice view. By 3:45 it was a bit cold for people to be hanging out here. At 4PM we skied to the road to catch the bus back to Kitzbuhel, and in our case another bus to Kirchberg. We skied 14,100 vertical in Kirchberg/Kitzbuhel and 11,100 in Pass Thurn. Tony Crocker wrote: Speaking of off-piste, James sent me an article about an off-piste guide in Kitzbuhel. The prime area for guided skiing in marked 3S on the trail map. It is an expansive area with 2,000+ vertical fall lines under the gondola that was built to connect Kitzbuhel with Pass Thurn in 2007. Here's the article. It's a bit of an advertorial for the guide but still highlights an interesting point about Kitzbühel that people don't immediately consider because of its Hahnenkamm racing reputation and low elevation. Unrelated: Kitzbühel was one of the few ski regions that hadn't been cheating on its piste length claim (Pistegate) before the German cartographer started checking them. Instead of length, they should verify and highlight that 56,000 acres stat. That 3S off-piste area is huge. You'll get to 56,000 aces if you include that IMHO. The article admits you need to be lucky or proactive and get after it immediately following a storm. Snow is not going to preserve long at that altitude most of the time.